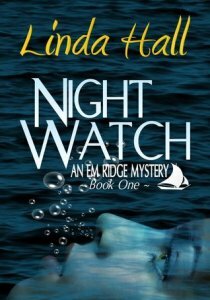 Author, Linda Hall sent me an e-copy of her novel Night Watch. 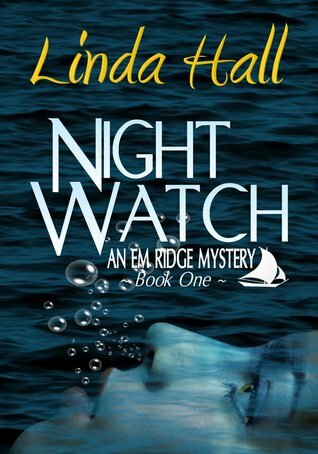 For yacht delivery captain, Em Ridge, having a billionaire’s daughter go overboard on her first captaining job is not a good beginning. The sailboat is new, state of the art, her crew on this trip include two close sailing friends. But an unknown fourth, who can’t even tie a bowline, and the unruly owner’s daughter turn the idyllic trip into an adventure not wanted. Two years ago Em buried her husband, her soulmate, her sailing buddy, and with him buried a secret. As hours on the open seas slide by, secrets are resurrected that tie Em’s past to a present, awash with murder and deception. Will Em’s career go overboard? Will the investigating detective help her or hurt her? Any why does the best boat delivery captain on the east coast pull at her heart strings? The oft foggy coast of Maine holds secrets it does not want to give up, and a lot of bodies can be hidden in The Pine Tree State’s largest city. Honestly, this was almost a five star read for me. The writing is marvellous. The setting is sublime. The character’s love of the ocean is palpable and the mystery, while not hard to figure out, was engaging. There were only a few things that kept it from being five star worthy for me and most hinge on simplicity, by which I mean simple plot devices. For example, the whole premise of the mystery is that a girl is murdered on a boat, while out to sea. There were only five people on that boat, including the dead girl. Despite this minuscule pool of suspects, Em is never included as one. Instead she’s permitted unprecedented access to case information and even asked to assist the detective. What? Why? Here’s another one, Em needs information about her husband’s death in order to put things together, then, without being asked or any communication between them a medical examiner decides to start looking at the 18 month old closed case again and sending her information. What? Why would he do that? It’s too simple a solution to a plot necessity. The big one, though, the one that literally made me set the book aside and play with my social media for an hour, because I didn’t want to have to read any more of it, was Em’s blind spot regarding a certain character’s trustworthiness. She meets up with him for the first time in 10 years, having crewed with him only once before (so they have no relationship, not even a nod as you pass friendship) and because he’s nice to her, she starts having ‘growing feelings’ for him within a day. But everything about him is suspicious and Em sees that, but she still trusts him in the face of OBVIOUS clues to his ill-intent and tells him everything, even going so far as to pass items to him that people are killing over. And there is no feasible reason she should, none. Nothing in this particular part of the story is believable. Every-time she ran to him and confided everything to him, I asked why and wanted to give up on her. In the end I just had to accept the story needed her to trust him to progress, but that’s not a good enough reason. The book also has a cliché, ‘Now that I have you at my mercy, let me tell you everything, answer all your questions and then conveniently botch killing you.’ ending that doesn’t feel all together natural. Plus, she doesn’t so much solve the mystery as stumble into the answer. Despite these complaints (and some thin characterisation), the book is very good. I enjoyed the fact that Em (with the exception of her interactions with one man) is smart and self-assured. I loved the setting. I liked the non-development of a non-relationship that slipped in at the end, but you can still sense is ‘something.’ They felt very broken but real in the last few pages. All-in-all, I had a few complaints, but am calling this a general success. I’ll be keeping my eyes on Mrs. Hall’s work for sure. This entry was posted in Uncategorized and tagged #indiefever, book review, challenges, mystery on November 30, 2014 by Sadie. 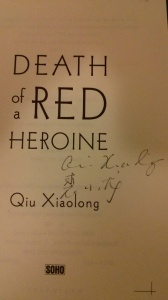 I picked up a used copy of Qiu Xiaolong‘s Death of a Red Heroine at Goodwill. You really can’t beat $0.70 for a book! After buying it, I gave it a wipe down (as I do anything I buy at Goodwill) and stuck it on the shelf to read someday. When I finally picked it up and opened it to the first page for the first time I found a surprise. It’s signed! I had a bit of a squee moment, I’ll admit it. Shanghai in 1990. An ancient city in a country that despite the massacre of Tiananmen Square is still in the tight grip of communist control. Chief Inspector Chen, a poet with a sound instinct for self-preservation, knows the city like few others. When the body of a prominent Communist Party member is found, Chen is told to keep the party authorities informed about every lead. Also, he must keep the young woman’s murder out of the papers at all costs. When his investigation leads him to the decadent offspring of high-ranking officials, he finds himself instantly removed from the case and reassigned to another area. Chen has a choice: bend to the party’s wishes and sacrifice his morals, or continue his investigation and risk dismissal from his job and from the party. Or worse. On finishing this book, I closed it feeling satisfied. This is generally all I ask of a book, but if I think back, I also remember that it took a good 200 pages for this book to get rolling and for me to really become interested and vested in it. Part of this is probably do to the fact that I only have a loose understanding of the events surrounding the Cultural Revolution and the subsequent Party politics that play an important part in this book. But it also just has a slow start, which isn’t helped a lot by the rather dry tone Chinese literature always seems to have. In the end, however, what I liked so much about the book is that it’s about good men trying, against almost impossible odds, to be good men. I don’t mean John McClane type heros, but ordinary men in extraordinary circumstances. 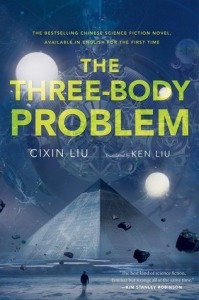 Chen, the main character is a coming to terms with the fact that his life has not turned out the way he hoped. He shows a consistent moral mettle that is impossible not to respect. His partner, Yu, is a man who was given very few choices in life but his dedication to both his job, doing the right thing and his wife are heart melting. It was these men and their character that carried the day for me. I’m glad to have read the book. Though not relevant to the review, I’m also going to admit to a long standing mistake on my part. 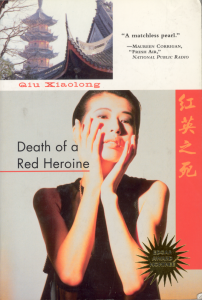 I’ve always thought the name of this book was Death of a Red Heron and that this is perhaps where the literary device took it’s name. I even continued to read the title as I expected it to be, rather than as printed, long after buying the book. So, when I opened it to the first page and finally really read it and discovered it reads Death of a Red Heroine I had a good long laugh at myself. Feel free to laugh at me too. This entry was posted in books/book review, Challenges and tagged book review, challenges on November 29, 2014 by Sadie. I borrowed a copy of Liu Cixin‘s The Three-Body Problem from my hubs. This is actually my husband’s book. 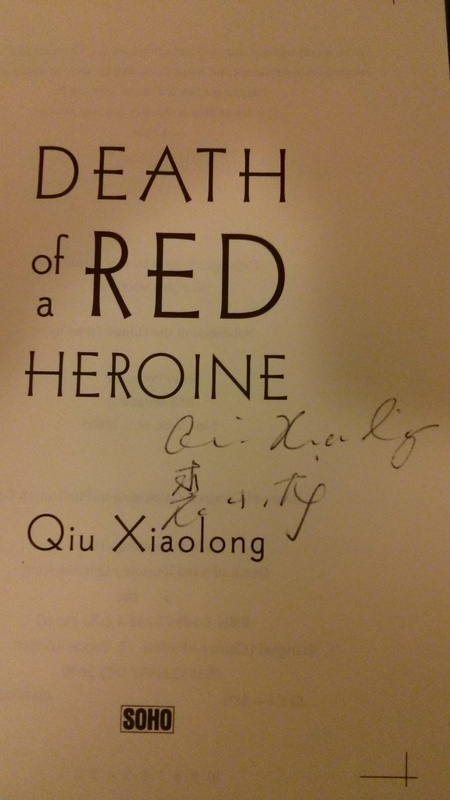 He received it as a gift from a friend who happens to be from China, with the explanation that ‘it is very popular at home.’ I have read a few of Liu Cixin’s short stories (They show up on the Amazon free list occasionally.) so I knew it would be interesting. Honestly, I can see why it is a bestseller in China. I can. But equally as honestly, this book didn’t do it for me. I often find Chinese to English translation read very dryly and this is no exception. (I’m pretty sure this is a cultural characteristic of Chinese writing.) But the book is also very slow to get going. The first half feels very random and though the end does tie it all together, I still spent 200 pages wondering what was going on. None of this is helped by the fact that it is very science heavy. Everything is explained well, but I didn’t particularly enjoy sciences lessons. Then, in the last half, when things do finally pick up I found myself irked about something else entirely. It’s hard to address without a spoiler of some sort, but the POV shifts somewhere new and that POV feels far too human. We’re told repeatedly that we don’t know what they’re like, but everything about them presents as human when it really shouldn’t have. All of the characters are also very thin. However, there are some interesting ones. Da Shi is one of the best anti-heroes I’ve come across in a while and I appreciated Ye Weing’s flat affect. I’ve heard that the 2nd and 3rd books are better than this one and if I happen across them I’d read them. But I’m not rushing out to buy them. This was just an OK read for me. This entry was posted in books/book review, Challenges and tagged book review, challenges, sci-fi on November 28, 2014 by Sadie.